Born and raised in Japan started study the Koto when she was three, based in NY since ‘02. Kurosawa received first prize at the National Japanese Koto Competition for students in ‘89 and ‘92, and a scholarship from The Agency for Cultural Affairs of Japan in ‘98. Her extensive performances in Japan, including appearances at Suntory Hall, Tokyo, and on NHK Broadcast TV, Kurosawa has toured in Canada, Germany, Malaysia, Russia, and the US. Kurosawa made her Carnegie Hall debut in ‘06. In ‘11 she was principal soloist in Daron Hagen's Koto Concerto Genji, which premiered in Stratford-upon-Avon, UK with Orchestra of the Swan and continuing to play with Hawaii Symphony Orchestra and so on. In ‘13, Kurosawa was principal soloist for the premier of The Memory Stone at the Houston Grand Opera. In ‘15 premiered Ballet: Tsuru commissioned by Houston Ballet and Asia Society Texas as a soloist and composer. Collaborated with world top Hip Hop dancer Les Twins at the world heritage Kiyomizudera, performed at World Economic Forum in Dalian, China and a soloist for Koto&Shakuhachi Concerto FUGAKU by Takashi Yoshimatsu at Suntory Hall Opening Gala with Tokyo Symphony Orchestra, also She continues to perform in local New York City venues such as Joe’s Pub, the Highline Ballroom, the Blue Note, Apollo Theater and other concert halls. 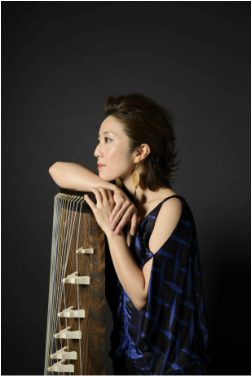 Kurosawa has been lauded by the NY Times for her graceful musicianship, “drawing on a timbral palette that [ranges] from warm and rounded to bright and metallic.” She also has received praise in the Washington Post and so on.